Eco Village is a budget-friendly campsite located at the backwaters of Warasgaon Dam, near Lavasa. Kick back and relax in the lap of nature, with a beautiful lake on one side, and the rolling green slopes of the Sahyadris on the other. 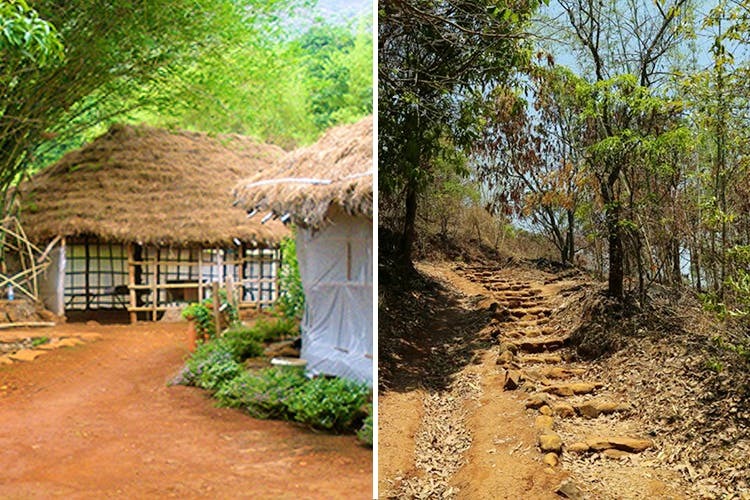 Eco Village is located near Pathershet village and will take you just over 2 hrs by road. The campsite is just off the Panshet-Lavasa Road and is just around 57km from Chandni Chowk, Pune. The last stretch of road to the campsite can be a bit rough, and directions can get a bit difficult – but the Eco Village staff are happy to guide you over the phone. Parking is available, a short walk away from the campsite. Eco Village is a rustic campsite – as real as it gets! Accommodation here consists largely of pitched tents and a small number of standing hut-style ‘rooms’ as well. Bathrooms are shared, and we recommend you carry all your own toiletries and essentials for the duration of your stay. We think nature lovers will love this campsite, as it offers multiple options for exploring the outdoors. Cool off with a swim in the nearby lake (with a tube), or go on a guided trek of the forest (at extra charge)! The food here is cooked and served in local Maharashtrian style, available in vegetarian and non-vegetarian options. For a small fee, you can even bring your own prepared meat (chicken/mutton) and ask for it to be cooked, or have a DIY BBQ around your own campfire under the stars. If you’re the kind of person who’d like to rough it out a bit and try something new – then Eco Village is right up your alley. If you’re not keen on an overnight stay, go for their day-trip packages – which allow you access to the campsite, as well as breakfast (with tea) and lunch. Eco Village’s overnight packages are extremely reasonable and include all meals (breakfast, lunch, dinner). We recommend visiting Eco Village in the monsoon season – when the dam will have sufficient water, and the natural surroundings will be lush and green. This is a no-frills camping/jungle-stay, so don’t expect the creature comforts of urban life – but at the same time, you should enjoy your stay in the beautiful surroundings and try to make the most of it.